I know. I am probaby the worst blogger that exists within the Typepad community. I promise it is for a good cause. I've been a busy little bee. I am proud to say I have self-taught myself Adobe Illustrator, which in turn enables me to design my very own STATIONERY line! So excited. I am finishing up the Christmas line which will debut this November. I have never been so excited for anything in my life (well okay, maybe it was little more exciting when I gave birth to my children)! There are three different cards using a super-unique Christmas color scheme, complete with lined envelopes. Everything is being printed on high-quality linen stock, which I personally LOVE to write on. There will be wrapping paper and coordinating ribbon. I've dsigned things that I love, and hopefully the public will feel the same way! It is so hard not to share the designs with everybody! You know the feeling. When you create something you are so proud of, you want to show the world! I just have to sit tight for another two months and the big day will be here! I thought I would share with you my new FAVORITE tool. Not only is it a great reference for graphic design, it is wonderful to utilize in trying out color schemes before you drag your cardstock stash out. This may be old news to some of you, but I just discovered it. 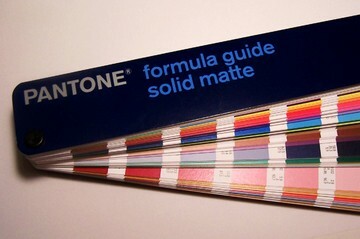 A Pantone Formula Guide. It is like the paint swatch book interior designers use, only this one is created with graphic designers in mind. It has swatches for 1,114 colors, each complete with a "recipe" so you can re-create the color easily on your computer. I have been using it like crazy to develop the color schemes for my new line. I highly recommend it! It takes a lot of guess work out of designing! I promise I'm still alive. Lots going on. Tons of magazine deadlines. Julie is coming this weekend to go over stationery line concepts, so I have been brainstorming. Trying to get everything down on paper so I can execute my designs. So much to think about. And of course there is volunteering at the school, soccer, ballet. Teething Ethan is no longer sleeping through the night. And there is normal everyday duties that multiply like rabbits when you get behind. So I promise I'll be back soon. As soon as I get a moment to take a deep breath. Study hall in the lobby, senior year. The year we really became good friends. We did a lot more talking than studying. We got to know each other and realized how similar we were. How much common ground there was between our personalities. 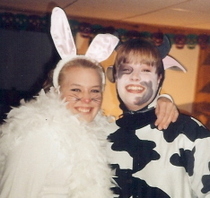 We did a lot of partying that year. But isn’t that what you’re supposed to do when you’re a senior? 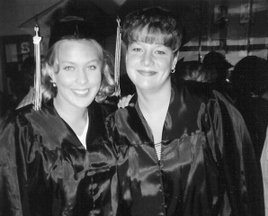 Then there was graduation. I wouldn’t have wanted that experience with anyone else. You made it so memorable. Love this photo of the two of us. We were so happy. Excited to get on with the next phase in our lives. Who knew what the future would hold. Then I went off to college. You came to visit me a few times and stayed in the dorms. Good times. 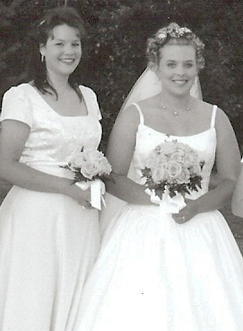 And who can forget my wedding and all of the events surrounding it. You were such an important part of that. You being there made the day that more special. Then I moved down south. And you happened by chance to hitch a ride in the right direction. We got to reminisce and talk about the good ol’ days. We both have children now and live miles apart. Emails are few and far between. Life gets in the way, and I know I should be better about that. But I know that the next time we see each other, we’ll pick up where we left off. Talk about high school and catch-up on gossip. Thanks for being such a true friend, in every essence of it’s definition.